This question is beyond obvious and antiquated. It should be buried and never allowed to resurface. We apologize in advance for brining it up now. Yet, despite all of the information out there, protein remains the focal point of many omnivorous minds. Whether you have been vegan for five days or five years, the protein question is bound to come up by some misinformed relative over the course of your holiday dinner. You could roll your eyes – you’ve been over this with them before – or raise an eyebrow and gesture to the heaping pile of plant-based goodness on your plate, but this may lead to some confrontation. To keep things civil this holiday season, we gathered responses from plant-based professionals so you can positively address this question and get back to enjoying your meal. Uncle Joe: Yeah, but where do you get your protein? You need plenty of protein to stay healthy! Response: All plant foods contain protein. Many plants contain more protein per calorie than meat. In fact excess animal protein drives cellular reproduction, rapid aging and susceptibility to cancer. A better question should be—how much animal protein is safe to eat, if any? Dr. Joel Fuhrman is board-certified family physician. With his years of experience transitioning ailing omnivores into healthy plant-based clientele, Dr. Fuhrman knows exactly what to say. If you’re up for a bit of conversation about the topic, steal Fuhrman’s response to turn the question back on Uncle Joe while you continue enjoying your savory kale salad. Aunt Barbara: I rely on a good roast chicken for my protein. How do you cook to make sure you get enough protein in your diet? Response: I love using my favorite qseudo grains like quinoa and teff to make protein-packed holiday loafs! Michelle Marquis, private chef and contributor to Jason Wrobel’s cookbook, “Eaternity”, knows exactly how to fuel her body. After discovering she had several food allergies (including gluten and soy), she made it her mission to develop delectable plant-based recipes devoid of food sensitivities. She now hosts pop-up dinners and brunches, which sell out every time. Give Aunt Barbara some culinary inspiration with Michelle’s simple advice. Little Cousin Charlie: We learned in school you need protein to be strong. So where do you get your protein? Response: From the same source as elephants get their protein from. Plants! Dominick Thompson is a vegan endurance athlete and owner of Crazies and Weirdos, the vegan apparel line famous for its “Eat What Elephants Eat” and “Clark Kent Was Vegan” t-shirts. Not only is he ripped, he has also competed in a number of triathlons on a mostly raw diet. Follow his advice and encourage Little Cousin Charlie to eat his lentil loaf if he wants to be big and strong like an elephant. Sister’s Boyfriend, Chris: I’m eating chicken and broccoli and I’m seeing mad gainz. Where do you get your protein? Response: To be honest, I don’t worry about protein but rather I focus on amino acids which are the building blocks of protein. You can find amino acids in fruits and vegetables. So I have no reason to worry about where my protein is coming from, because I am consuming what is essential. John Lewis, also known as the Badass Vegan, is a plant-based fitness consultant and influencer. A quick scroll through Lewis’ Instagram will prove that you don’t need animal protein to build major muscles. Niece Katie: I heard protein is important, and protein comes from meat. How do you get it? 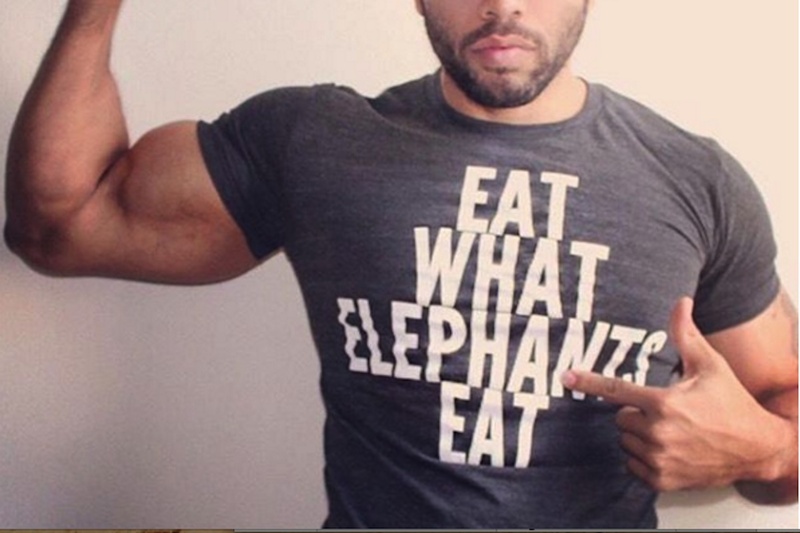 Response: I get my protein the same way the king of the jungle does! I eat plants like gorillas. #gorillastrong! Nicole Derseweh is an enthusiastic, creative plant-based chef known for her festive pop-up brunch series. Her elaborate unicorn and mermaid-themed brunches for sixty-plus guests are true delights, and they happen to be packed with protein. Use Derseweh’s response to keep the conversation fun and lighthearted. Nephew Dylan: Where do you get your protein? Do plants have protein, too, or just stuff like milk and turkey? Response: Protein is found in every single plant in the world. Plants are alive and protein is a necessary nutrient to all living things. Did you know even lemons are 16% protein? Dotsie Bausch is an Olympic silver medalist turned plant-based advocate. She earned her medal in women’s cycling on a plant-based diet, and now she is on a mission to spread the word through her non-profit, Compassion Champs. This year, she will be making a 100% plant based Thanksgiving meal for eight. Her menu includes a lentil and quinoa main dish, mashed yams, fall harvest salad with apple cider vinaigrette, artichoke, vegan spinach dip, cranberries, mini-vegan pot pies and a vegan stuffing with wholegrain bread, lentils, onions, celery and sage. We’re copying both her response and her menu for our Thanksgiving table! I try to treat this question like it’s the first time I’ve heard it. Keep in mind that most folks are genuinely curious and don’t realize plants have protein. There is also no way for them to know that you’ve answered this same question over one million times since going vegan, so don’t punish them for it. Lead with your heart, then with the facts, and you can’t go wrong. Happy Thanksgiving! !